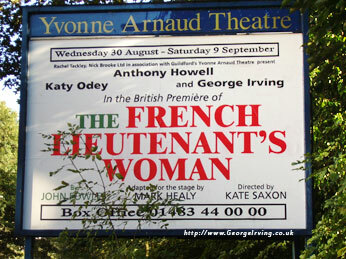 Nestling between a gently flowing river and a bank of late blooming trees the Yvonne Arnaud Theatre provided the perfect venue for the UK premiere of The French Lieutenant’s Woman. Large enough to accommodate the capacity audience the theatre proved to be surprisingly intimate, the stage being only inches from the front row. A desk adorned with the tools of a writer’s trade, gently lit with a lamp, set in the centre of a multilevel stage is the first glimpse of the evening ahead. To the excited mutterings of the opening night crowd the lights dim and George Irving playing The Writer takes his place on the stage. The sound of a typewriter and the image of a writer struggling with his art open the play. The Writer is soon joined by an assembly of his disparate characters playing in his mind. 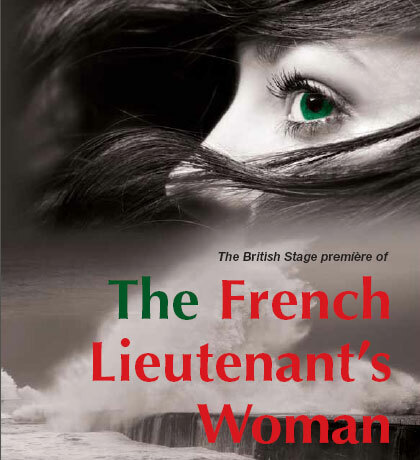 The Writer screams “Stop” and tells the audience “I don’t know where to begin …” and so opens The French Lieutenant’s Woman. The Writer is haunted by Sarah, other characters float in and out of his consciousness but Sarah is the constant that troubles him. Marching around the stage despairing of how to resolve his issues and begin writing, The Writer introduces his “surrogate” in the story, Charles Smithson, referring to Charles as intelligent, educated and handsome. The Writer notes how narcistic authors can be, the first of several comedic comments which were clearly appreciated by the audience. Anne Kavanagh played the fearsome Mrs Poulteney to perfection, oozing the rampant hypocrisy of the character. Daniel Tuite was the perfect foil for her opening scene playing Mr Forsythe, the Vicar, a much more charitable character. Anthony Howell was excellent as Charles Smithson portraying his confusion and indecision with a subtle touch. His interpretation of Charles worked fantastically well opposite Hannah Young as Ernestina whose emotional final scene demonstrated the unravelling of her life consummately. 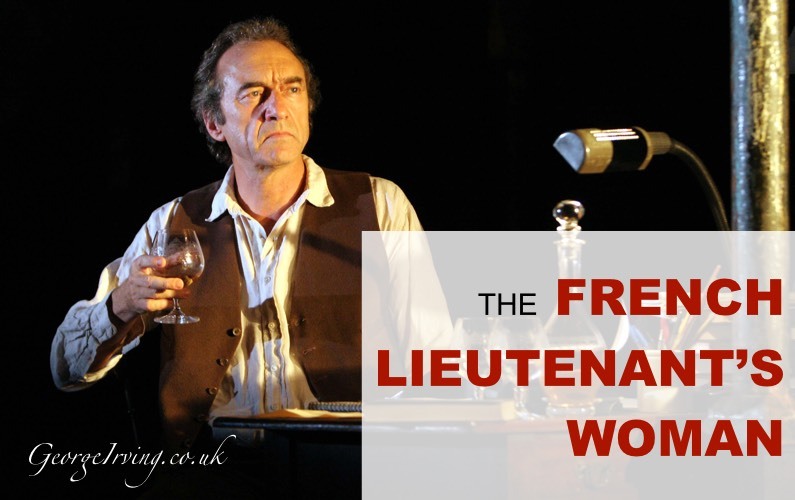 The Writer is a constant presence on stage throughout the play, which is almost 3 hours long with one 20 minute interval, moving around the stage either interacting with his characters or watching events unfold. It is a highly choreographed and physically demanding piece, with numerous changes of setting handled cleverly by the cast ably aided by the lighting focusing on the relevant scene and dimming on other areas. It must have been exhausting for the cast, several of whom played more than one role in the ensemble cast. George Irving also has more than one character to play as when Dr Grogan is introduced The Writer announces that he needs to “… work this thing from the inside” and promptly adds a long jacket and tie to his casual writer’s garb. A transformation smilingly shared with the audience as he tries an accent for the good doctor but declares it to be awful, tries a second accent declaring it to be even worse before trying the Irish accent and informing the audience of his choice by exclaiming “Bingo!” George managed his transition between The Writer and Dr Grogan seamlessly, constantly shuffling the doctor’s jacket and tie, omnipresent on the stage in either one guise or the other. I’ll admit I had doubts as to how on earth the book could be adapted for the stage without losing at least some of the feeling of the original work. In fact this version was very close to the original book and as such was a masterly adaptation of it by Mark Healy who worked closely with the author John Fowles. Fowles work has not traditionally translated well into other mediums, The Magus achieved cult status as a book but the film version failed to make the same impact. While the 1981 film version of The French Lieutenant’s Woman was well received, nominated for 5 Oscars and winner of 9 other awards it was a very different kind of adaption straying so far from the original story as to be virtually a different piece of work. Sadly the author died in November 2005 without the opportunity to see this wonderful adaption – he would surely have approved. The buzz of conversation during the interval seemed to focus on how the majority found John Fowles work a difficult read, a sentiment I didn’t readily understand as I had enjoyed the book immensely. My major concern had been how the play’s adaptation could equal it. I needn’t have worried the adaptation was excellent and with stellar performances from the entire cast it exceeded all expectations. The general consensus of those that had struggled with the book was that the adaptation was considerably more accessible. The stunning set served as the basis for all the different scenes – no easy task in an adaptation of a book whose events span 2 years and from Lyme Regis to London via America. It was cleverly designed on two levels and accommodated all the scenes perfectly. Charles vision of how the future would pan out for all the characters was handled cleverly with The Writer standing silently behind Charles flipping a coin. There was some wonderfully subtle acting from George, when taking up the role of the bearded man reading the paper, he could be seen undulating gently perfectly in time with the sound track of the train from London to Exeter. All too soon we are at the climax of the play and we’re all curious how the adaption will handle the double ending of the book. Brilliantly! The first ending plays out with The Writer pleased with the outcome before Sarah tells him that it should be different. Sarah orchestrates her preferred ending to the incredulous author who questions the wisdom of it before considering her reasoning and rushing back to his desk to capturing it ending the production to ardent applause from the audience and two curtain calls. The exchange of broad smiles between George Irving and Anthony Howell (Charles Smithson) seemed to indicate they were as pleased with the opening night performance as the rapturous audience were. It is a fantastic production and I heartily recommend that if you can possibly attend do so, you will not be disappointed in any way.